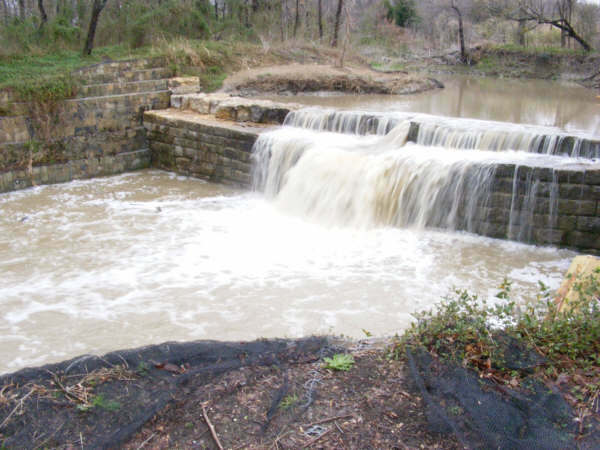 The Old Stone Dam is located in the upper reach of Cottonwood Creek about 1,000 feet North of Exchange Parkway in Allen, Texas. Cottonwood Creek is a tributary of Rowlett Creek and drains 19 square miles of Plano, Allen, Parker and McKinney. The dam, built in 1874 as a water supply reservoir for the steam engines of the Houston & Texas Central Railway, is one of the oldest structures in the Dallas/Fort Worth area. The site included a water tower and a pump house.